A Cape Breton family dove into tennis this winter in a surprising way. 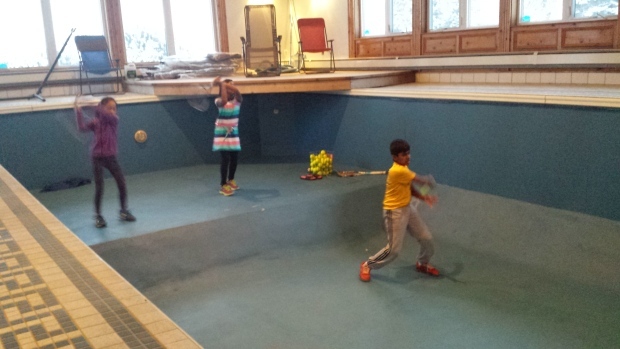 Sivakumar Annamalai drained the indoor pool at his home in Coxheath to provide a place for his kids and their friend, who play competitively during the summer, to practice for indoor tournaments. The children hit tennis balls at a net at the end of the pool but he said what they really need is a proper indoor tennis court in the area. "It's something like practising on the wall, so that helps them to get the consistency in the game as well as to practice their strokes, but it's not like really playing in the court or a match play — those are the things they miss." Rayirth Sivakumar, 11, practices in the pool with his sister Rhea and friend Alice Zhao, both nine years old. "The pool helps with your consistency and rallies and stuff, " said Rayirth Sivakumar. "An indoor court is a lot different, on the net the ball just comes right back to you and it doesn't move you around at all. When you're practising with a partner on the court, it's a mix of everything." Alice Zhao, who recently finished second in her age group at the Indoor Junior Atlantic Tennis Championships in Newfoundland, said practising in the pool helps but an indoor court would put them on a level playing field with other competitors. "It would help our training during the winter if we're going to Atlantics or any other tournaments and we can actually have lessons in there once and a while," said Alice Zhao. Kevin Hall, the head pro at the Cromarty Tennis Club in Sydney, said an indoor court would make a big difference for all the local children who play during the summer months. "Right now they're going off to other sports and they could be on the court training specifically for tennis and trying to develop their game." The Cromarty Tennis club is working to develop an indoor facility. Bill Buckland, an executive member of the club who has played nationally, said the club has 150 to 200 members during the summer, 100 of whom are children. "I think it would enhance the level of play for Cape Bretoners and allow us to have the same clubs that they have in Truro, New Glasgow and Halifax," said Buckland. According to Buckland, the club investigated the cost of a stand alone indoor tennis facility but it's too expensive. He said, instead, they're hoping to partner with the Cape Breton Health Recreation Complex, or the Dome, at Cape Breton University to share the space with other sports including soccer. Right now the CBU facility has an artificial grass turf and part of it would need to be converted to a surface suitable for tennis. The club is getting estimates on how much that would cost but it's prepared to help fund raise. "We need Tennis Canada on board, we need the municipality, the province, all the big players. We could get the players there to play year round and make it work," said Buckland.